Hand Stamped Silverware and Personalized Gifts. Mr. and Mrs. Fork Set for the Bride and Groom. Hand Stamped with wedding date. Customized for your wedding day. Perfect engagement gift. Announcement For Such A Time Designs specializes in carefully designed hand stamped silverware to serve all of your life's moments. With a great attention to detail, it is my pleasure to create product that you will be proud to gift and have in your home! All items are made to order, making the product you receive even more special as it is specifically designed for you. Here at For Such A Time, you can expect to receive the greatest care and customer service. My heart's desire is to give you an experience that can't be had anywhere else. It is a pleasure and an honor to have the opportunity to serve you and I can't wait to get started!! Some of our most exciting features have been seen in partnership with the Jamba Juice National Oatmeal Day #teamoatmeal Campaign, Woman's Day Magazine, HGTV Canada, Lauren Conrad's Instagram & Website, and The Hallmark Channel Home & Family Show! Current Production time is 5-7 days. I do my best to respond to messages within 24-48 hours and appreciate your patience with me as I strive to give each person the time and focus they deserve! All of For Such A Time's social media channels are about encouraging you through your week and having fun at the same time! Be sure to follow along below for updates, giveaways, and coupon codes. Before you make a purchase please check out my policies or message me if you have any questions about a listing! I am happy to answer all of your questions! It is an honor to create for you! For Such A Time Designs specializes in carefully designed hand stamped silverware to serve all of your life's moments. With a great attention to detail, it is my pleasure to create product that you will be proud to gift and have in your home! All items are made to order, making the product you receive even more special as it is specifically designed for you. IVF got this. Infertility awareness. Hand stamped spoon. Pregnancy Announcement. Sugar ohh, honey honey. 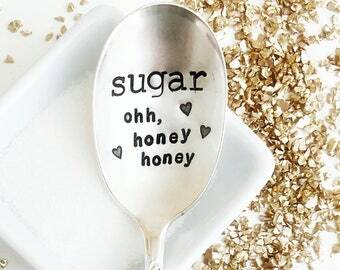 Honey Spoon, Sugar spoon. Stamped Spoon. I Cerealsly Love you. Hand Stamped Spoon. Valentines Day. Cereal Spoon. Gifts under 25. I seriously love you. Trust in the Lord with all your heart. 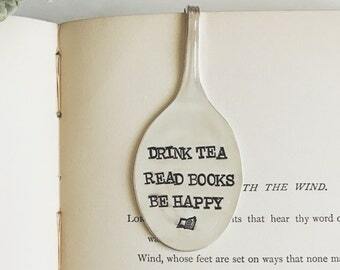 Spoon Bookmark, the perfect gift for a bookworm - bible bookmark, books, stocking stuffer. 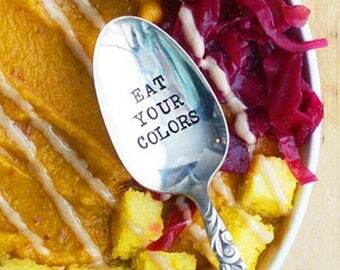 Eat your colors. Hand stamped spoon. Healthy lifestyle gift. Gift for your favorite foodie. As seen on The Colorful Kitchen. I'm proud of you. - Mom. Hand Stamped spoon. 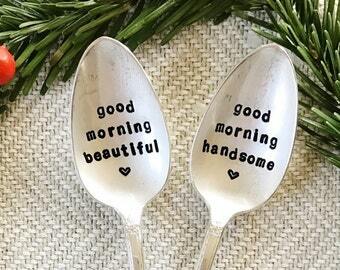 Personalized spoon. TAKE HEART. John 16:33. Hand Stamped Spoon to encourage the brokenhearted. 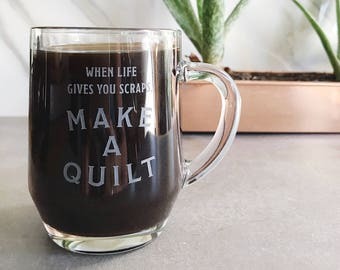 Coffee Before Everything. Hand stamped spoon. Spoon for coffee lovers. Stamped Spoon, You're my cup of tea. Hand Stamped Spoon. Unique gift for the tea lover. Pair with a Tea Cup for the perfect gift. Mom you were right. About everything: Hand Stamped Spoon for Mom. Gift idea for her. Stocking Stuffer for Mom. Mother's Day. Beautiful girl you got this. Lowercase Hand Stamped Spoon: best friend gift. Encouragement. Strong and beautiful. Silver plated jewelry dish. Repurposed Serving piece: Pretty Little Things. Small dish for your jewelry. 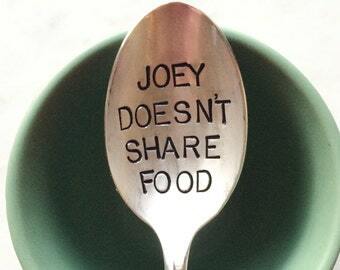 Joey doesn't share food. Stamped Spoon. Friends - for the friend who doesn't like to share food with anyone. As seen on Buzzfeed. Pregnancy Announcement Spoon. We're Expecting. Stamped Spoon. Unique Announcement for having a baby. Home Is Where Your Mom Is: Hand Stamped Spoon for Mom. Gift idea for her. Stocking Stuffer for Mom. Good Morning Gorgeous. Hand Stamped Spoon: Lover's Spoon. Gift for Girlfriend or Wife. Cute stocking stuffer idea. Fueled by Jesus & Coffee. 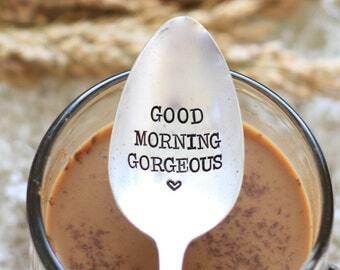 Stamped Spoon for your morning devotions. Scripture Spoon. Perfect gift for pastors or Bible Study leaders. HEY SUGAR Spoon by For Such A Time. Adorable Sugar Spoon. Perfect Hostess Gift. Unique kitchen gadgets and gifts. Gifts under 25. Mr. and Mrs. Fork Set with special design. Hand Stamped with wedding date. Personalized with the bride and groom's wedding date. I asked Aly to do a custom order for my wedding and try to match a silverware pattern I had already purchased. She was amazing! The perfect gift for the mom who has just about everything! These are personal, vintage and gorgeous! At some point we all come to the same realization. Mom was right. About everything. In 2011, I found this old stamping set on a dusty antique shop shelf...and the rest is history. For National Oatmeal Day 2014, For Such A Time had the pleasure of making custom spoons for Jamba Juice & Today Show. This spoon has helped woman in recovery from eating disorders. I love that my product can aid in real life situations. This photo was taken by Katheryn Moran Photography and reflects my heart and how I feel about what I do. For Such A Time began with a lucky find; a vintage letter punch set in a wooden, dovetail box. With hopes to create gifts for family and friends, these dreams soon turned into a much larger endeavor. For Such A Time is now serving people all over the world and creating timeless gifts for all of life's special moments. For Such A Time specializes in using made in the USA, antique stamping sets to repurpose silver plated flatware and give it new life. Gifts that can be used for weddings, anniversaries, coffee & tea time, healthy living encouragement, and much more. You're one stop shop for gifts for everyone on your list. Aly Nickerson, owner and creator, loves the thrill of finding new flatware to stamp on and coming up with new ideas to bring to her customers. Fueled by her desire to serve people and showing people that the small details of their life are important and precious, Aly now calls For Such A Time Designs her passion. Hi, I am Aly Nickerson. Lover of laughter, grace and iced coffee. I am truly humbled to create a product that people all over the world can resonate with and enjoy! Thank you for stopping by my shop! I chose this partner because everything is made in the USA and these items are hand etched and I appreciated their attention to detail.